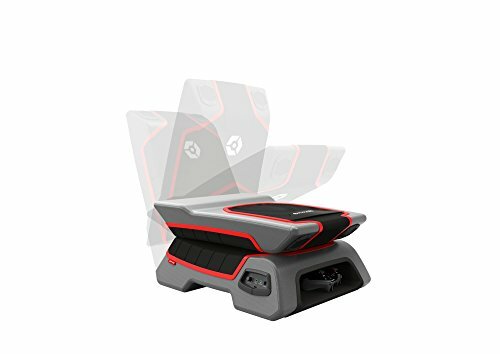 When I first come across the Gioteck RC-3 Foldable Gaming Chair, I had already been looking for a gaming chair that allowed TV connectivity for a more extraordinary gaming experience. I must admit that the design of this chair didn’t impress me, specifically because most other models I’ve tried in the past had the same combination of colours: black and red. Plus, it gave me the impression that it was much too lightweight for a gaming chair, which wasn’t actually that bad for someone who keeps changing the actual position of his gaming console. Keep reading the Gioteck RC-3 Foldable Gaming Chair review below for the whole scoop on this particular model. At first sight, the Gioteck RC-3 Foldable Gaming Chair appears to have a minimalistic design – I’d say extra-terrestrial, or maybe Star Wars-inspired, especially when the LED illuminations are on. 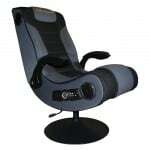 This makes it look quite interesting and actually very compelling for any avid gamer, not to mention that adding this Gioteck chair to your room will certainly rev up its appearance. The seat is pretty large, offering just the right amount of space to easily accommodate any gamer. 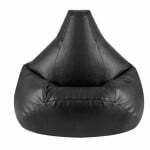 The padding makes it very comfortable, and the back of the chair will actually mould after the shape of your upper back, enhancing comfort even more. I liked how the front of the chair is designed to follow the natural shape of your legs while you’re sitting down. This offers the extra support that you need to comfortably hold the controller in your hand while also preventing that numbness that unavoidably occurs after a few hours of bending your knees at a 90-degree angle. 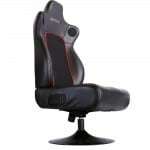 The volume knob and audio input and output are located on the right side of the Gioteck RC-3 Foldable Gaming Chair, within the reach of your hand. 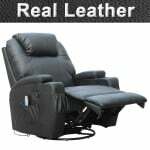 The chair gives you the option to either connect it directly to your TV for stunning sound effects, or to an MP3 player if you’d like to listen to your music instead. The design of the Gioteck RC-3 Foldable Gaming Chair is foldable, meaning that you can always fold it down into a more compact size when you’re not using it. This facilitates storage – and I’m happy to say that, when folded, the chair easily fits under my bed, so I never have to compromise the space of my living room! As I said before, the design itself didn’t impress me – and seriously, they could have found a better combination of colours. But this aspect isn’t as desirable as the sound quality. The sound comes through pretty clear, but only as long as the volume is low. When I cranked it up, the sound was unclear, and it had very annoying distortions that ruined my gaming experience. Gioteck could have implemented a better audio system, but given that the chair sells at £69.99, I shouldn’t have expected more. One last aspect I didn’t like was the poor quality of materials used to manufacture the chair. Mine got scratched after a couple of weeks, and it now looks a little old, which is very disappointing. 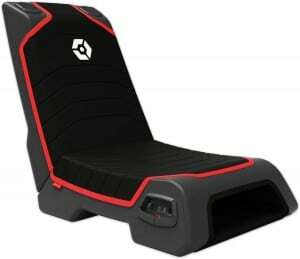 In spite of a few cons, I appreciate the great comfort of the Gioteck RC-3 Foldable Gaming Chair, but I think that it needs substantial improvements in many respects. First, sound quality is crappy; second, appearance lacks much to be desired; and third, materials are very prone to scratches. For a chair in this price range however, the Gioteck RC-3 Foldable Gaming Chair certainly performs well, and I’m sure that most beginners will appreciate its convenient features.